This picture is of a World War 2 era flag which is on display at the Edmonton Air Museum. 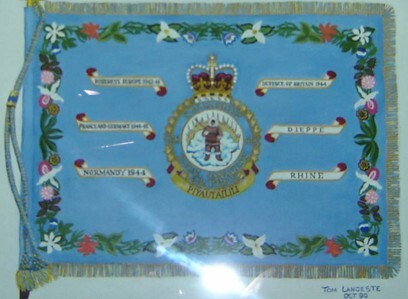 The illustration, presented to Captain Tom Langeste in October 1990 is of the flag of 418 Squadron RCAF, which was Canada's highest-scoring squadron in WWII, in terms of both air-to-air and air-to-ground kills, and in terms of both day and night operations. Depicted in the middle of the flag is the Squadron badge which features an Inuit hunter in traditional clothes and spear with the Northern Lights in the background. The Squadron motto in Inuktitut is Piyautailili ('Defend Even Unto Death').